How Much Are Vaccines On Medicare? It's Complicated : Shots - Health News The federal health law makes it easier for most people with private insurance to get recommended vaccines without a copay. But the changes don't apply to people covered by Medicare. Got Medicare? That vaccination could cost you. The health care overhaul law makes it easier for most people with private insurance to get the vaccines they need without going into their pockets for a copay. Medicare beneficiaries don't get the quite same sweet deal, though. 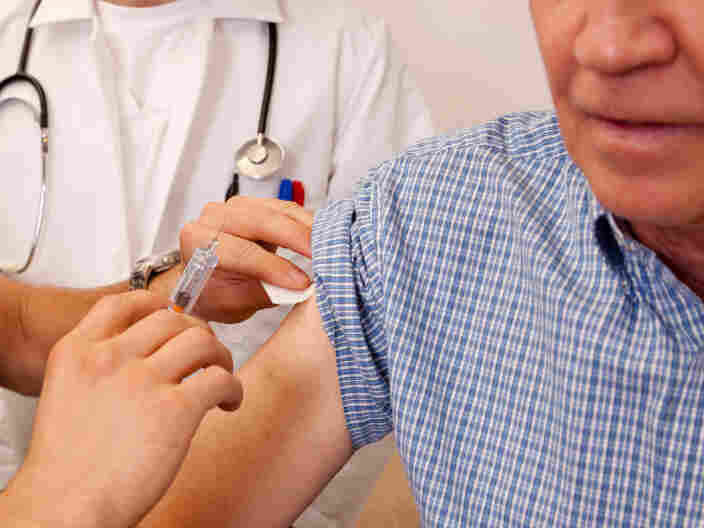 Under the law, new health plans or those whose benefits have changed enough to lose their grandfathered status (70 percent of plans or more, by some estimates) must provide free of charge those vaccines recommended by the Center for Disease Control and Prevention's Advisory Committee for Immunization Practices . But Medicare recipients are still on the hook for some vaccine copayments. Medicare Part B covers the flu, pneumonia and hepatitis B vaccines without copays, but all other recommended vaccines are covered by Medicare Part D drug plans, and cost-sharing for these vary widely from plan to plan. Out-of-pocket costs deter seniors from getting the shots they need, according to a study published by the General Accountability Office last December. The study found that in 2009, for instance, cost sharing for the shingles vaccine for seniors averaged $57, but ran as high as $195. In another example, the GAO found that out-of-pocket costs were lower for the tetanus vaccine, averaging $25, but ranged as high as $70. The study said copayments for the shingles vaccine, in particular, posed problems for seniors. Shingles, caused by the same virus that's responsible for chicken pox, causes a painful rash and can lead to permanent nerve damage. The vaccine is recommended for adults age 60 and older, whether or not they had chicken pox as a kid. But only about 10 percent of people who should be vaccinated get the shot. In a 2008 study, more than 7 in 10 primary care doctors said $29 was the upper limit that patients were willing to spend on that vaccine. Medicare Part D plans, which cover the shingles vaccine, have a lot of flexibility in how they design their drug benefit, says David Lipschutz, a policy attorney at the Center for Medicare Advocacy in Washington. Copayments may vary significantly from plan to plan. Seniors who rely on a Part D plan for their prescription drug coverage might be able to lower their out-of-pocket costs by switching plans, he says. The Part D annual enrollment period runs from Oct. 15 to Dec. 7. A previous version of this post incorrectly said that the flu, pneumonia and hepatitis B vaccines have copays under Medicare Part B. They do not.